June 20 was the day in which Japanese first arrived in Hawaii as emigrants in 1868. 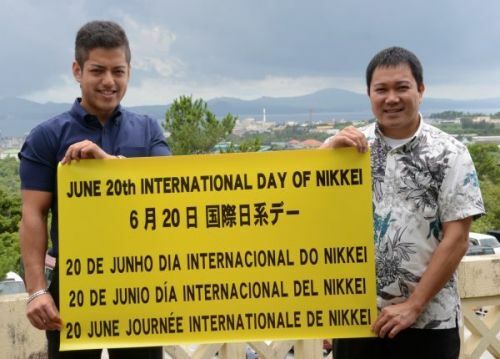 Second-generation Japanese-Argentinian Higa-Andreas and third-generation Japanese-Peruvian Tadashi Isa-Andreas, who both live in Nago City, proposed the establishment of the Nikkei Day. They said that they were happy and that they hope that Nikkei people will take this opportunity to deepen cultural exchange with other Nikkei people from around the world. The purpose of Nikkei Day is to establish one’s identity as Nikkei and to deepen cultural exchange with Nikkei people from around the world. The abovementioned persons proposed the establishment of Nikkei Day to the Pan-American Nikkei Association (APN) and the APN Peru Chapter. They supported the World Uchinanchu Day that was established in 2016 and strove to establish a Nikkei version. Isa said, “The Uchinanchu created the Uchinanchu Day and cherish their identity. During the declaration at the convention, June 20 was declared as the International Day of Nikkei to facilitate the link among the Nikkei people of the world and to further contribute to the international community.